Hino was our second malamute, big "teddy bear" with BIG heart. 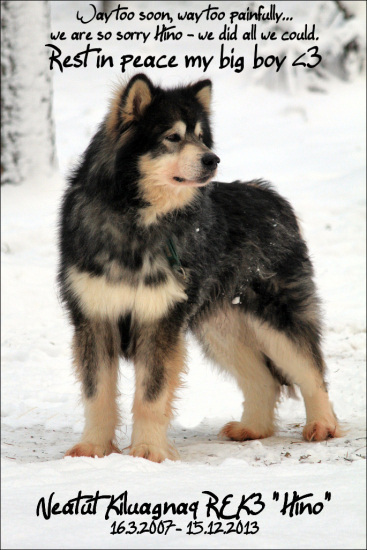 Hino was bred by kennel Neatut and his official name Neatut Kiluagnaq means South-eastern wind. Calling name Hino came from Iroquese indians and it means Guardian of the Sky or Thunder God. Hino's parents are gorgeous Nordiclight's Thunder WPD, WTD "Thunder" and Neatut Walilertok "Arwen". 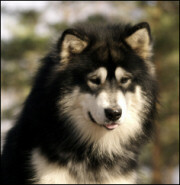 Hino did prove to have awesome temperament; calm and patient, malamute who gently asks for affection. All people, who have met Hino, were fell in love with his temperamet. Hino was adjusting towards everything, all the new things were taken with calmness. He had working abilities and eagerness despite of his calm temperament. Hino was a big boy, but sometimes he still thought that he could fit in to our lap. Hino's structure was good, even though his height, 71 cm, was way too big compared to breed standard (64,5 cm). Big size is clearly disbenefit to working, because part of dog's energy is going just to him to move his big and strong body. Hino was also woolly, in other words long coated. 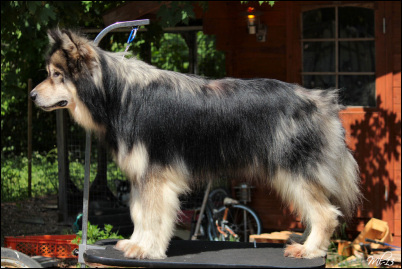 Long coated malamute isn't conformable to breed standard, even though it's quite impressive. Long coat isn't so weather proof as normal malamute coat, it'll get wet much more easier and faster. Also shedding is giving the owner much more work, because all shedded hairs need to comb off, and it isn't easy. Despite Hino's big size, he had very nice movements. Hino was strong and reliable sled dog. His speed wasn't fast, but you could count on to him to get you out of the woods. Because his big size, Hino didn't attend much to official sled dog races, because he couldn't keep up with rest of the team. Although Hino has one official working result, REK3. In Alma's weight pull competition 2012 Hino did pull result 6,33 times his own weight. Hino was very strong and he worked, but at his own speed. Hino loved backpacking and carried his doggy packs with pride! Hino had A/A hips and 0/0 elbows, but he had large affected cataract in his eyes. In year 2010 Hino was diagnosed hypothyrosis, which did affected his coat. Hino had medication for hypothyrosis for two years, but last year he didn't have medication without any symptoms. Hino was also spayed. Thank you Anne and Jokke for letting us to share our life with this big hearted boy! We lost our beloved boy way too soon to stomach torsion (bloat), 15.12.2013.
there is thousand memories to comfort us. thousand memories, worth more than gold. they, who live in our hearts. they are inside of us, so quietly. Some day, sorrow will be easier to carry.